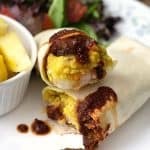 Scrambled Eggs made from Chickpeas make these Vegan Breakfast Burritos a delicious grab n go meal for those busy mornings. A taste of New Mexico in every bite! Prepare red chile sauce if using along with potatoes and meat substitute, set aside. In small bowl, whisk the chickpea flour, nutritional yeast, and all the spices EXCEPT the black salt until mixed thoroughly. After the eggs have set for 1 hour in the fridge, saute the onion, pepper, garlic. and chiles in the veg broth until softened. Assemble burritos by adding eggs, meat-sub, potatoes, and salsa to a tortilla and roll.